How many days left until Christmas? We’re counting down, aren’t we? Yes, it’s just around the corner now and I should be counting but there’s something else that’s distracted me. Starting today Hitler and Mars Bars is available for .99 cents as a Kindle Countdown offer. This offer lasts until Friday. If you’re looking for a heartwarming story of overcoming adversity and finding where you belong, this might be the story for you. I’ve posted an excerpt from the first chapter so you can see if it appeals to you. If it does, check out the offer on its Amazon US page – but do it by Friday. “Wake up, Erich,” his mother said softly. Leaning over him, she gently shook his shoulder. Shrugging away from her touch, he turned over in the narrow metal bed. She shook a bit harder and he opened his eyes, squinting at her silhouette in the moonlight. “Mutti! You’re here!” Erich sat up and threw his arms around her neck. “I knew you’d come!” he cried. “Shh…don’t wake the other children.” She hushed him as she pulled back his thin, woollen blanket. Shivering in the cold air, he jumped out of bed and scurried the few steps to the fireplace. The embers from the fire, set before bedtime, still glowed and occasionally crackled in the open grate. The waning fire radiated a modest heat and Erich savoured its warmth. The moon was low in the early evening sky, but its light streamed through the partly drawn curtains. Erich’s mother pulled his white cotton nightshirt over his head and he hunched forward, shivering as cold draughts eddied around him. She quickly threaded his arms into his shirt. Erich squirmed against the prickly fabric which scratched at his back. “You don’t have anything else so you must. Hurry now!” she urged him. She pulled up his short brown trousers and leaned over to lace his boots. She pushed his arms into his ragged woollen coat, then pulled it firmly around him, noticing how baggy it was. “They don’t give us much. And it’s rotten! It makes me sick. And I’m so tired,” he complained. The food shortage was severe as the war drew to an end. Everyone struggled to get enough to eat. Malnutrition and the poor quality of available food frequently made the children ill. To conserve energy they went to bed after their evening meal. She frowned, looking at him. The waist of his trousers was loose and his bony knees seemed large on his thin legs. As they stepped out of the door the darkness enveloped them; no street lights lit their way. Their eyes adjusted to it as they walked briskly down the country lane. Erich held tightly to his mother’s hand. He pressed against her, almost tripping her in his eagerness to be close to her on this rare visit. 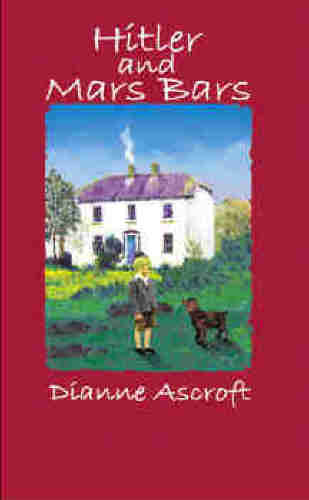 This entry was posted in December 2013 and tagged Dianne Ascroft, Germany, historical fiction, Hitler and Mars Bars, Irish fiction, Kindle Countdown, Kindle Countdown offer. Bookmark the permalink.